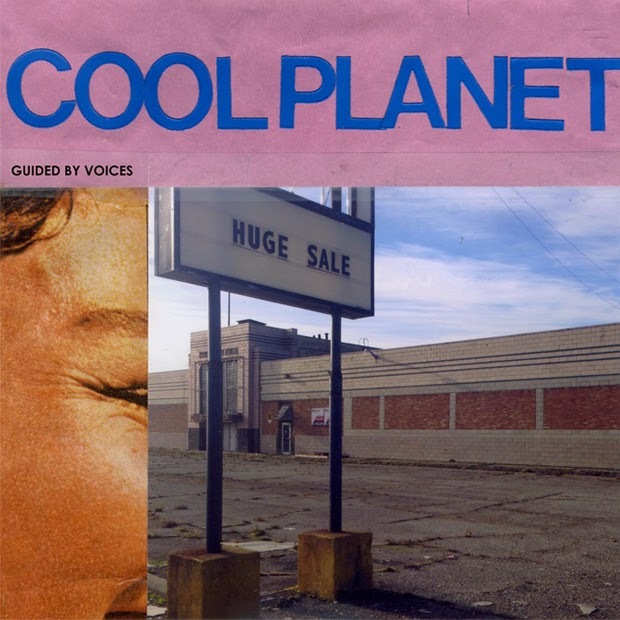 The reunited Guided by Voices is an unstoppable force to be reckoned with. After a comment in the press by Robert Pollard regarding English Little League being the last reunion LP, GBV seems, instead, hellbent on destroying that comment. Following said LP, Planet Cool comes out just a shade under three months since the previous 2014 LP Motivational Jumpsuit. It's almost as if GBV is now in a race against time with themselves and their new found song flow. Taking a slightly different approach, Cool Planet bears a few distinctions setting apart from its predecessor. While some tracks off Motivational Jumpsuit were recorded at Cyberteknics, this LP is primarily a studio outing all around (sans Tobin Sprout's home recorded tracks). Also, this album features the return of Kevin March, former GBV drummer from '01-04. The change in personnel came about following the firing of "classic line-up" drummer Kevin Fennell after a publicized dispute over Fennell selling his drum kit on on eBay for an astronomical fee, and then leaking a private email conversation with Pollard. What this has to do with anything? Nothing. Some folks do enjoy a dense side of gossip with their LPs, however. Authorization Zoo- 4 Crunchy stomp crooner opens the LP. Verse is somewhat kitschy, and childlike before exploding into a soaring melodic blanket. One of the singles released for the LP, "Authoritarian Zoo" is near classic. Fast Crawl- 3 Slower, strung out, brittle carried along by it's punctuated drums and doomy bassline. Nice provocative choice for cut 2 of the LP. Fairly short, and somewhat unsettling in a sly way. Ends with above bowling ball, acoustic guitar massacre. Psychotic Crush- 3 The first Tobin Sprout composition of the record. A lazy, stoned garage rocker glued together by its none too incredible main guitar riff. Prickly, psych rock that's rather comforting. Impeccably Sproutian. Costume Makes the Man- 4 Acoustic lead, somber yet hopeful Pollard intimate cut. Incredibly simple, yet strikingly beautiful in a cryptic way. Hat of Flames- 4 YES! Sounds like GBV covering a GBV song. I guess that's where a million and a half songs can get you these days. The kick off verse is one for the ages before spiraling off into a prog clipped wind down. These Dooms- 2 One meandering, sparse moody gap track. Nothing much going on here. Basically, a Pollard poem come to life while drums pound away at this rather formless chug. Table at Fool's Tooth- 5 Short and anthemic. Sounds like four different songs pieced together all culminating in a handful of quick, payoff melodies and the declarative "a table set at fool's tooth!' Perfect. All American Boy- 5 Tobin Sprout has probably recorded better songs, but how can anyone deny that when he finished this the band didn't rejoice. This feels like the Beatles culmination of his career. Wonderfully swoonful, epic, demanding at times. A bit of Queen thrown in there too. Get out your lighters and wave them high. You Get Every Game- 3 Acoustic strums while Pollard sings some barren lyrics. Dribbles off into Tobin Sprout backed repeating melody. Not the greatest, but sullenly hypnotic. Pan Swimmer- 5 Short, brilliant, incredibly infectious. A mini anthem with familiar GBV melodies intertwined. Goddamn. Partially wish this song was longer, but love that it barely cracks the one minute mark. The Bone Church- 2 A Tobin Sprout/ (guitarist) Mitch Mitchell collaboration. Sprout takes the vocals, while Mitchell plays the rest. A dirty, sludgy, and unfortunately forgettable track. Bad Love is Easy to Do- 3 This song is so goddamn idiotic. I hate it! I hate it! But yet, damn it's infectious. The repetitive, brain dead hook grows on ya fast. Tobin Sprout also duets with some pretty dumb lyrics. Still, I kinda love it. The No Doubters- 2 Sluggish guitar pop plod that meanders about. Sullen Pollard speak-sings about. The whole thing reeks of bland, despite its hard-rock push at the end. Narrated by Paul- 4 Sprout track! Dipping back into the Beatles catalog, Sprout comes up with a heaping scoop of haunting melodic melancholy. Brittle stare out the window piano track. This one rattles the bones. Barely a minute long, and only a few lyrics deep, but damn. Cream of Lung- 1 This one's the utter throw away of the album. It's called "Cream of Lung" and it doesn't get much better than the title. Tremolo warbles about in this short, bizarre snippet. Males of Wormwood Mars- 4 One of the singles released for the LP. A tom rolling affair backed by an incredibly simple, and memorable, punchy guitar hook. One of the rare GBV tracks where the guitar lines are probably more memorable than any melodic lines. Ticket to Hide-4 Tobin Sprout is back on the attack with this saddened acoustic track. Sprout speaks of "solitude" and the track is all about said solitude. The "it might get louder'' bit with electric accompaniment really nails this down for a strong finish. A true better with repeated listens track. Cool Planet- 4 Starts off like possible dreck. Then the ante gets kicked up in a drum fill/guitar assault. THEN, it breaks out in a melodic deceleration backed by high walking basslines and manic drums!!! The double vocals drive it home. GBV for the win! One hell of a strong closer. Comment for Psychotic Crush appears to be missing its end. just listened to this album again yesterday. "all-American boy", "bad love is easy to do" "males of wormwood mars," and "ticket to hide" are the stand-out tracks for me, but the rest of the album's growing on me. I like Kevin March's drumming. Hell, I like "Bone church."